Operation Magic Carpet is a widely known nickname for Operation On Wings of Eagles (Hebrew: כנפי נשרים‎, Kanfei Nesharim), an operation between June 1949 and September 1950 that brought 49,000 Yemenite Jews to the new state of Israel. 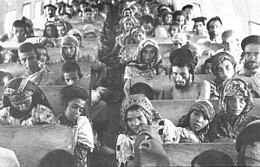 During its course, the overwhelming majority of Yemenite Jews – some 47,000 Yemeni, 1,500 Aden, as well as 500 Djiboutian and Eritrean Jews and some 2,000 Jews from Saudi Arabia– were airlifted to Israel. British and American transport planes made some 380 flights from Aden, in a secret operation that was not made public until several months after it was over. At some point, the operation was also called Operation Messiah's Coming. Book of Exodus 19:4 - Ye have seen what I did unto the Egyptians, and how I bore you on eagles' wings, and brought you unto myself. Book of Isaiah 40:31 - But they that wait upon the LORD shall renew their strength; they shall mount up with wings as eagles; they shall run, and not be weary; and they shall walk, and not faint. The Operation Magic Carpet was the first in a series of operations. Israel sees the rescue operation as a successful rescue of Yemen's community from oppression towards redemption. 49,000 Jews were brought to Israel under the program. A street in Jerusalem, one in Herzliya, one in Ramat Gan, and another in Kerem HaTeimanim, Tel Aviv, were named "Kanfei Nesharim" ("Wings of Eagles") in honor of this operation. In 1948, there were 55,000 Jews living in Yemen[clarification needed], and another 8,000 in the British Colony of Aden. Following the 1947 UN Partition Plan, Muslim rioters attacked the Jewish community in Aden that killed at least 82 Jews (1947 Aden riots) and destroyed a number of Jewish homes. Early in 1948, accusations of the murder of two Muslim Yemeni girls led to looting of Jewish property. Esther Meir-Glitzenstein argues that collusion between Israel and the Imam of Yemen who "profited hugely from confiscatory taxes levied on the Jewish community" led to a botched operation in which the Jewish community suffered terribly. Reuven Ahroni and Tudor Parfitt argue that economic motivations also had a role in the massive emigration of Yemeni Jews, which began prior to 1948.
economic straits as their traditional role was whittled away, famine, disease, growing political persecution, and increased public hostility, the state of anarchy after the murder of Yahya, often a desire to be reunited with family members, incitement and encouragement to leave from [Zionist agents who] played on their religious sensibilities, promises that their passage would be paid to Israel and that their material difficulties would be cared for by the Jewish state, a sense that the Land of Israel was a veritable Eldorado, a sense of history being fulfilled, a fear of missing the boat, a sense that living wretchedly as dhimmis in an Islamic state was no longer God-ordained, a sense that as a people, they had been flayed by history long enough: All these played a role. ... Purely religious, messianic sentiment, too, had its part, but by and large , this has been over-emphasised. In 1959, another 3,000 Jews from Aden fled to Israel, while many more left as refugees to the United States and the United Kingdom. The emigration of Yemeni Jews continued as a trickle, but stopped in 1962, when a civil war broke out in North Yemen, which put an abrupt halt to further emigration. In 2013, a total of some 250 Jews still lived in Yemen. The Jewish communities in Rayday were shocked by the killing of Moshe Ya'ish al-Nahari in 2008. His wife and nine children emigrated to Israel. Other members of the Jewish community received hate letters and threats by phone. Amnesty International wrote to the Yemeni government, urging the country to protect its Jewish citizens. The human rights organization stated that it is "deeply concerned for the safety of members of the Jewish community in northwestern Yemen following the killing of one member of the community and anonymous serious threats to others to leave Yemen or face death". During the Gaza War, the Jewish communities in Raydah were attacked several times. It was forbidden for native-born Yemeni Jews who had left the country to re-enter, rendering communication with these communities difficult. Muslims were therefore hired as shelihim (emissaries) to locate the remaining Jews, pay their debts, and transport them to Aden. Little came of this. ^ Ministry of immigrant absorption, Israel: “On Eagles’ Wings” – Aliyah from Yemen (1949). Retrieved 23 June 2012. ^ "MLibrary Digital Collections: King James Bible: Exodus 19:4". quod.lib.umich.edu. Retrieved August 31, 2013. ^ "MLibrary Digital Collections: King James Bible: Isaiah 40:31". quod.lib.umich.edu. Retrieved August 31, 2013. ^ Tom Segev, 1949: The First Israelis. 1998, pp. 182-185. ^ Ahroni, R. The Jews of the British Crown Colony of Aden: History, Culture, and Ethnic Relations. Brill, 1994: P210-11. ^ Reuben Ahroni, Jewish Emigration from the Yemen, 1951-98: Carpet Without Magic, pp.xi-xii, p. 1. ^ Esther Meir-Glitzenstein, The Exodus of the Yemenite Jews − A Failed Operation and a Formative Myth, Resling, Tel Aviv 2012. ^ 'Operation Magic Carpet: Constructing the Myth of the Magical Immigration of Yemenite Jews to Israel,' in Israel Studies, vol.16, No.3 (Fall) 2011 pp. 149-173. ^ Reuben Ahroni, Jewish Emigration from the Yemen, 1951-98: Carpet Without Magic, pp.xi-xii, p.20. ^ Parfitt, Tudor. The Road to Redemption: The Jews of the Yemen, 1900-1950. (Leiden: E.J. Brill, 1996). ^ Tudor Parfitt (1996). The Road to Redemption – The Jews of the Yemen 1900-1950. Brill. p. 285. ^ Tudor Parfitt, The Road to Redemption: The Jews of the Yemen, 1900-1950, BRILL, 1996, p. 239ff. ^ Meira Weiss, 'The Immigrating Body and the Body Politic: The 'Yemenite Children Affair' and Body Commodification in Israel', in Nancy Scheper-Hughes, Loïc Wacquant (eds. ), Commodifying Bodies, Sage Publications, 2002 pp. 93-110, pp. 93ff. ^ "Wife, children of gunned down Yemenite teacher make aliyah - Israel News, Ynetnews". Ynetnews.com. June 20, 1995. Retrieved August 31, 2013. ^ Amnesty Int’l urges Yemen to protect its Jew, JTA, 24-12-2008. ^ Reuven Ahloni, Jewish Emigration from the Yemen, 1951-98, pp. 11ff.